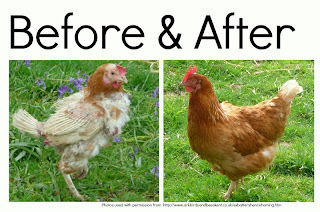 Hens and Hooves: Rescue Ex-Battery Hens! Did you know that 85% percent of the 30 million chickens in the united states are kept in cruel conditions? Most of them are kept in large sheds, some housing more than 20,000 chickens, without natural light or fresh air. That's not all, they are kept in small 17 x 17 inch cages, where they can barely move because there's usually 4-5 chickens per cage. When many are born, their beaks are cut so they don't peck each other in the cages, and the males are killed shortly after birth because they cannot provide the farms any eggs. After a year when they've passed their egg-laying peak, they are killed in large numbers in terrible ways like suffocation and mass slaughter. Some hens are lucky enough to be rescued from the farms by people with good intentions. But what are those people going to do with all those chickens? They find them homes with caring people who will nourish them back to health and then care for them until they die of natural causes. Read below if you are or know someone who is one of those caring people! where they are being nursed back to health. Are you interested in giving some intensively farmed hens a better life? I was contacted by Pat at Ark Birds and Bees in Kent because she has about 100 ex-battery hens that have been rescued from cruel conditions. Here's what she has to say about them and how you can help! "Every year we rescue hens that have spent their lives living at egg farms. These hens are often only around a year old, are bald, timid and traumatised from the shock of moving. Within as little as 3 months of TLC and being able to do the things that most chickens do naturally, many of them will have regrown their feathers and will be back in lay. A small number of others might not be as lucky and the stress of such a drastic change of environment might be too much for them and they might not make it." "We ask for a donation of £5 per hen to cover the costs of buying them from the farm, any treatment that they might need and to help pay towards the feed of any hens that we cannot find homes for. We also give written and verbal instructions on how to best care for them and will be on standby to offer any further help and support that might be needed at any point afterwards." If you would like to help, please contact Debbie or Pat by emailing the1ark@btinternet.com. Click here to visit their website and learn more about battery hens and how to help! NOTE: These particular hens are in the United Kingdom. Unfortunately adopting battery hens in the United States is very complicated, but if you go to your local Craigslist, there are sometimes people who have some in need of a home. An alternative is Petfinder.com where you can find chickens that need homes, although they're not always battery hens. i have been planing to adopt some bettery/exbattery hens. i alredy have hens but i haven't adopted any but the next flock might be.